As climate disruption bears down, we’re witnessing the earth-shattering onset of heartbreaking suffering, dislocation and injustice. And this is just the beginning. We’ve got to act now. If we do, we can still hopefully dodge completely cataclysmic disruption, and the solutions on display at the 2015 National Bioneers Conference this year are where the hope is. This is the real deal. This is the time. Here’s a taste of what’s on deck. One sign of genius is to be able to distill mind-numbing complexity into simplicity itself, and to question the most basic assumptions we hold. What can we do right now with existing off-the-shelf technologies and solutions, and what measurable effects would each one have? Why accept the idea that we cannot actually bring CO2 levels back down to pre-industrial levels of 350ppm? Paul will present the startling data from his Project Drawdown that has assessed the 100 top technologies to pull carbon out of the atmosphere. It’s a massive collaborative research project that will provide lucid pathways for immediate action on a global scale. The good news is that it’s actually do-able—now, here and everywhere. And you will be very surprised by some of the answers. Because of the corporate media megaphone, we’ve been misled about how large the climate movement really is among growing numbers of cities and states. It’s huge and growing fast. The leadership of Governor Jerry Brown has positioned California to become the game-changer for global climate leadership to build resilience from the ground up and link with other sub-national initiatives and networks worldwide. Legendary activist Tom Hayden will dramatically paint the emerging landscape of how the California model is spreading rapidly both domestically and abroad with the formation of Green Blocs both at the state level and among nations. At the center is the resolution of environmental and social justice and the rich-poor divide. This is the real game-changer. Check out our new Bioneers e-book on this topic too! Your heart will swell with hope. Rising seas are no longer in the future, and the worst-case scenarios are just as likely as the best-case ones. Legendary Dutch water management strategist Henk Ovink has helped lead the way, supporting incredibly sophisticated water management practices and policies in a nation that’s 60% below sea level. Holland needs the whole world on board to succeed—we all do. Henk brought his expertise to the New York Metropolitan Area after Hurricane Sandy’s devastation. Based on his suggestions and process, the US Department of Housing and Urban Development (HUD) is funding breakthrough green infrastructure approaches in the region. Now he is bringing it to California. These are proven practices that give us the best shot at building coastal resilience. Holland recently formed a formal partnership with California to start seeing how to implement these breakthroughs. Fellow water wizard Andy Lipkis will update the astonishing policy advances his group TreePeople has helped lead for 40 years to build an integrated urban watershed for Los Angeles. With the epic drought bearing down, suddenly policy makers and public officials are not just listening—they’re acting to make one of the nation’s most notoriously unsustainable cities into a green model of wise water management that integrates ecology, economy and justice. Andy is networking globally, including in drought-ravaged Australia where the nation has instituted a national program where everyone becomes a watershed manager. Yes, the tide is turning and it’s breathtaking. Even in the face of a Canadian government that is their Bush-Cheney era, the Indigenous activist Eriel Deranger has helped lead Canada’s huge Idle No More movement to unprecedented success challenging the catastrophic Tar Sands oil extraction in Alberta. First Nations have managed to stop the hard-right, oil-loving government in its tracks by using a unique Rights-Based Framework in Canadian law. This movement is led primarily by Indigenous women and the battle is raging, with elections coming up this fall. This is one of the really big ones—failure is impossible. Please learn all you can and do all you can. We’re also experiencing the severe health effects of climate disruption and it is becoming a potent catalyst for action. Impacts range from heat illness to asthma and changes in vector-borne disease. It also threatens our food, air, water, shelter and security. It disproportionately impacts the most vulnerable. The extraordinary health activists Barbara Sattler, R.N. and Linda Rudolph are on the front lines, the national nurses union is becoming a powerful force politically, and it’s just the beginning. Learn how to put health front and center as an organizing strategy, and see what we all can do to prevent the worst and build the public health systems we’re going to badly need for the 21st century. We’ve long known that transforming the way we grow our food is phenomenally important for people and planet. As it turns out, agriculture has the potential to be a major player in the effort to, in Paul Hawken’s words, drawdown carbon. The game-changer is Carbon Farming to sequester carbon in soil, including scaling up organic farming and holistic rangeland management. John Roulac of Nutiva and John Wick of the landmark Marin Carbon Project will show how this strategy is at the top of everyone’s list for immediate practical solutions. Another hot topic will be the Carbon Economy Disruption. The Divestment movement is just one reflection of the larger reality—that fossil fuels are simply becoming a lousy investment, compared to the ongoing clean energy boom. Learn from some of the wisest analysts and strategists how fast the economics are changing, including Mike Brune, Executive Director of the Sierra Club, Atossa Soltani of Amazon Watch, and reporter Mark Schapiro whose stunning research helps show the way to a clean energy economy. Join the Revolution from the Heart of Nature! Hey, there’s lots more including brilliant sessions on Climate Education, but you get the drift. The real question is how all of us can take this actionable intelligence and the life-changing connections that occur at Bioneers and move them out into our worlds—now. 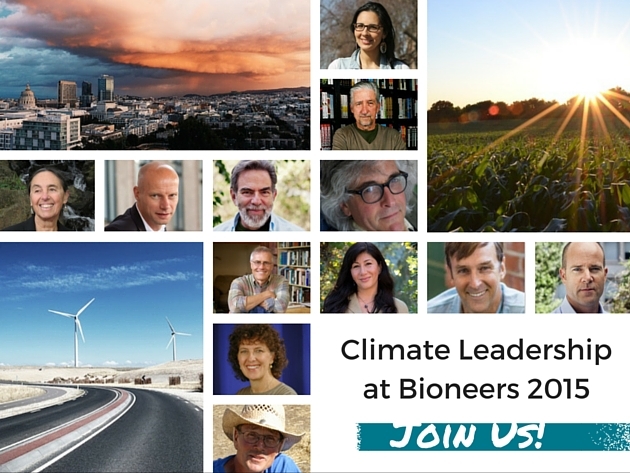 We really look forward to seeing you at Bioneers 2015 because the revolution has begun and the time is now.